Back view of the X3 Plus. Taiwan's Gigabyte is fitting a 3200 by 1800 screen on its latest gaming laptop, making it among the growing number of vendors adding so-called "3K" displays to their PC products. Gigabyte's gaming brand AORUS unveiled the X3 on Monday, a day before the start of the Computex Trade show in Taipei. The product comes in two models including the X3 Plus, which has the 3200 by 1800 pixel screen. We checked out the laptop and found it to be the high-end gaming machine you would expect. The device has a stealth bomber-like look, with two large vents in the back for airflow. As a 13.9-inch gaming laptop, the X3 Plus is fairly thin at 0.9 inches (22.9 mm). It's not exactly light and weighs 4.12 pounds (1.87 kilograms), but is still easy to carry. AORUS has put some nice bells and whistles on the laptop, with a mousepad that has a glass surface, and keyboard keys that can light up. Included are five keys on the far left side that can be configured for specific actions when playing games. This helped give the X3 Plus a premium feel. One of the biggest draws is obviously the screen, which showed colors quite vibrantly, almost neon-like when viewing the Windows 8 interface. A trailer for the game "Battlefield 4" looked exceptionally sharp, showing off explosions and weapons fire in better clarity than a typical 1080p screen. The X3 Plus display, however, isn't a touchscreen. The 3200 by 1800 resolution also means the laptop's battery life isn't great, and lasts about 3 to 4 hours, according to Gigabyte. 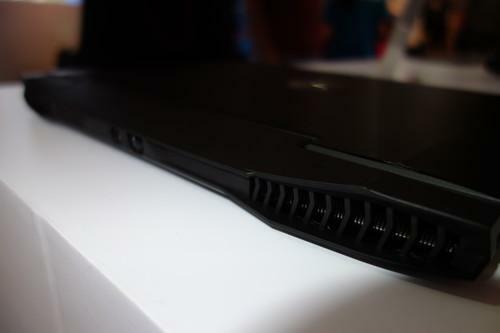 The laptop will use an Nvidia GeForce GTX 870M graphics card, and the latest Intel fourth generation Core i7 chip. Memory and storage configurations include up to 16GB of RAM, and 1 Terabyte of SSD. The device can also display 4K content over an attached monitor through a MiniDisplay port. All of this comes at a high price. The X3 Plus model starts at US$2199 when bought with the 3K screen. The cheaper X3 goes for $2099, but only has a 2560 by 1440 pixel display. The high-end laptop will start shipping to the U.S. in the third quarter.